December 28, 2012  For the first time in a decade of war, more active-duty troops took their own lives this year than died fighting in Afghanistan. The national suicide hotline is one way the Department of Veterans Affairs is trying to help troops and vets. 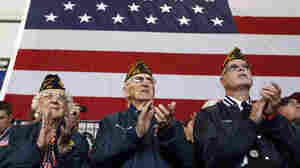 December 27, 2012  The Department of Veterans Affairs wanted to reduce a backlog in veterans' claims for disability benefits. Instead, the problem has worsened this year, in part, the VA says, because the department made it easier for more vets to file claims. December 17, 2012  Police continued to investigate the mass shooting at Newtown, Conn., on Monday, as the town started to bury the victims. Robert Siegel talks to Quil Lawrence. December 17, 2012  Police continue to investigate why Adam Lanza killed 26 students and staffers at Sandy Hook Elementary School in Newtown, Ct. Lanza then killed himself. Police are holding the details of their investigation close. December 15, 2012  The nation is reeling from yesterday's deadly shooting, nowhere more than in the community of Newtown, Conn. Police have been cautiously releasing details about the killings. Many local residents are also just learning the facts of what happened, as they try to carry on with life. December 14, 2012  Robert Siegel talks to Quil Lawrence about a prayer vigil held for victims of the elementary school shooting in Newtown, Conn.
November 12, 2012  Two weeks since Hurricane Sandy hit the East Coast, nearly 200,000 people remain without power along the eastern seaboard. Many also have no heat as the winter approaches. In Brooklyn, FEMA is registering people in Red Hook to see if they qualify for federal aid. 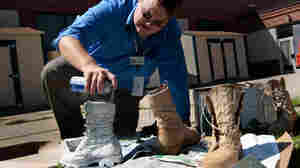 November 11, 2012  The military veterans who have been cleaning up and rebuilding in New York and New Jersey say that volunteering helps them as much as it supports the local residents. They say getting back into a chaotic environment with a clear and worthwhile mission helps with the transition to civilian life. November 5, 2012  Governor Andrew Cuomo agreed to issue an executive order to allow voters to cast ballots at any polling site, even outside their neighborhoods. Voters will sign affidavits that they're legally registered to vote. Some polling places were rendered unusable by Hurricane Sandy. Melissa Block talks to Quil Lawrence for more. November 5, 2012  A day before the election, some storm-stricken New Yorkers were trying to figure out where to vote. Meanwhile, the New York City Board of Elections is under pressure to make things run smoothly. November 4, 2012  New York city Mayor Michael Bloomberg said today that 30,000 to 40,000 people are homeless in his city after the storm. He compared the scope to hurricane Katrina. On Sunday, many New Yorkers who had planned to watch or run in the cancelled New York city marathon instead looked for ways to help. The closest hard-hit area for many was Staten Island, connected to Manhattan by a Ferry. November 2, 2012  We look at the continued impact of superstorm Sandy, four days after it made landfall. November 2, 2012  Superstorm Sandy is interfering with planning for Election Day in New York and New Jersey. Though neither of the reliably Democratic states is expected to decide the presidential election, authorities are trying to find ways for millions of voters to cast ballots. October 24, 2012  On a foot patrol in Kandahar, Nick Staback lost both of his legs after he stepped on a homemade bomb. Over the next year, his mother, Maria, became a tough coach as he learned to walk on two prosthetic legs, and together they adjusted to what she calls the "new normal" for their family.